Allan, Kori 2019. Volunteering as hope labour: the potential value of unpaid work experience for the un- and under-employed. Culture, Theory and Critique, Vol. 60, Issue. 1, p. 66. Bochow, Astrid 2018. Middle Classes in Africa. p. 157. Jakimow, Tanya 2018. Volunteers’ practices of care in community development as a model for citizenship in Medan, Indonesia. Citizenship Studies, Vol. 22, Issue. 2, p. 145. Aubrey, Lisa. 1997. The Politics of Development Cooperation: NGOs, Gender and Partnership in Kenya. London: Routledge. Boesten, Jelke, Mdee, Anne, and Cleaver, Frances. 2011. “Service Delivery on the Cheap? Community-Based Workers in Development Interventions.” Development in Practice 21 (1): 41–58. Brown, Hannah. 2013. “‘Home-Based Care Is Not a New Thing’: Legacies of Domestic Governmentality in Western Kenya.” In Making and Unmaking Public Health in Africa: Ethnographic and Historical Perspectives, edited by Prince, R. J. and Marsland, R., 14–61. Athens: Ohio University Press. Burton, Andrew, and Jennings, Michael. 2007. “Introduction: The Emperor's New Clothes? Continuities in Governance in Late Colonial and Early Postcolonial East Africa.” The International Journal of African Historical Studies 40 (1): 1–25. Chatterjee, Partha. 2011. Lineages of Political Society: Studies in Postcolonial Democracy. New York: Columbia University Press. Comaroff, John L., and Comaroff, Jean, eds. 1999. Civil Society and the Political Imagination in Africa: Critical Perspectives. Chicago: University of Chicago Press. Craig, David, and Porter, Doug 2006. Development beyond Neoliberalism: Governance, Poverty Reduction and Political Economy. London: Routledge. Geissler, P. Wenzel, et al. 2013. “Introduction: Sustaining the Life of the Polis.” Africa 83 (5): 531–38. Gupta, Akil, and Ferguson, James. 2002. “Spatializing States: Toward an Ethnography of Neoliberal Governmentality.” American Ethnologist 28 (4): 981–1002. Harrison, Graham. 2004. The World Bank and Africa: The Construction of Governance States. London: Routledge. Hearn, Julie. 1998. “The ‘NGO-isation’ of Kenyan Society: USAID and the Restructuring of Health Care.” Review of African Political Economy 25 (75): 89–100. Hill, Martin. 1991. The Harambee Movement in Kenya: Self-Help, Development and Education among the Kamba of Kitui District. London: Athlone Press. Hilton, Matthew, and McKay, James. 2011. The Ages of Voluntarism: How We Got to the Big Society. Oxford: Oxford University Press. Holmquist, Frank. 1984. “Self-Help: The State and Peasant Leverage in Kenya.” Africa: Journal of the International African Institute 54 (3): 72–91. Jennings, Michael. 2003. “We Must Run while Others Walk: Popular Participation and Development Crisis in Tanzania 1961–9.” Journal of Modern African Studies 41 (2): 163–87. Jennings, Michael. 2008. Surrogates of the State: NGOs, Development, and Ujamaa in Tanzania. Bloomfield, Conn.: Kumarian Press. Jennings, Michael. 2009. “Building Better People: Modernity and Utopia in Late Colonial Tanganyika.” Journal of Eastern African Studies 3 (1): 94–111. Jones, Andrew. 2008. “The Rise of Global Work.” Transactions of the Institute of British Geographers 33: 12–26. Kaler, A., and Watkins, S. C.. 2001. “Disobedient Distributors: Street-Level Bureaucrats and Would-Be Patrons in Community-Based Family Planning in Rural Kenya.” Studies in Family Planning 32 (3): 254–69. Lacey, Anita, and Ilcan, Suzan. 2006. “Voluntary Labor, Responsible Citizenship, and International NGOs.” International Journal of Comparative Sociology 47 (1): 34–53. Lal, Priya. 2012. “Self-Reliance and the State: The Multiple Meanings of Development in Early Post-Colonial Tanzania.” Africa 82 (2): 205–19. Lewis, Joanna. 2000. Empire State-Building: War and Welfare in Kenya 1925–52. Oxford: James Currey. Lorimer, Jamie. 2010. “International Conservation ‘Volunteering’ and the Geographies of Global Environmental Citizenship.” Political Geography 29 (6): 311–22. Mamdani, Mahmood. 1996. Citizen and Subject. Princeton, N.J.: Princeton University Press. Maxon, Robert. 1995. “The Kenyatta Era 1963–78: Social and Cultural Changes.” In Decolonization and Independence in Kenya: 1940–93, edited by Ogot, B. A. and Ochieng', W. R., 110–47. London: James Currey. McWha, Ishbel. 2011. “The Roles of, and Relationships between, Expatriates, Volunteers, and Local Development Workers.” Development in Practice 21 (1): 29–40. Milligan, Christine, and Conradson, David, eds. 2006. 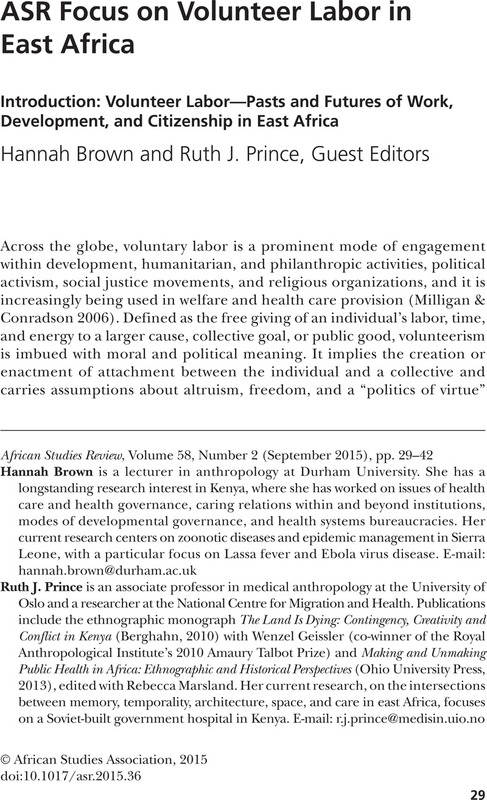 Landscapes of Voluntarism: New Spaces of Health, Welfare and Governance. Bristol, U.K.: Policy Press. Mindry, Deborah 2001. “Nongovernmental Organizations, ‘Grassroots,’ and the Politics of Virtue.” Signs 26 (4): 1187–211. Mittermaier, Amira. 2014. “Beyond Compassion: Islamic Voluntarism in Egypt.” American Ethnologist 41 (3): 518–31. Mkandawire, Thandika. “Thinking about Developmental States in Africa.” Cambridge Journal of Economics 25 (3): 289–314. Muehlebach, Andrea. 2013. “On Precariousness and the Ethical Imagination.” American Anthropologist 115 (2): 297–311. Ndegwa, Stephen N. 1994. “Civil Society and Political Change in Africa: The Case of Non-governmental Organizations in Kenya.” International Journal of Comparative Sociology 35 (1–2): 19–36. Ndegwa, Stephen N. 1996. The Two Faces of Civil Society: NGOs and Politics in Africa. Kumarian Press Books on International Development. West Hartford, Conn.: Kumarian Press. Odinga, Oginga. 1967. Not Yet Uhuru. London: Heinimann. Parreñas, Rheana Juno Salazar. 2012. “Producing Affect: Transnational Volunteerism in a Malaysian Orangutan Rehabilitation Center.” American Ethnologist 39 (4): 673–87. Perlin, Ross. 2011. Intern Nation: How to Earn Nothing and Learn Little in the Brave New Economy. London: Verso. Prince, Ruth J. 2013. “‘Tarmacking’ in the Millennium City: Spatial and Temporal Trajectories of Empowerment in Kisumu, Kenya.” Africa 83 (4): 582–605. Redfield, Peter, and Bornstein, Erica. 2010. “An Introduction to the Anthropology of Humanitarianism.” In Forces of Compassion: Humanitarianism Between Ethics and Politics, edited by Bornstein, E. and Redfield, P., 3–30. Santa Fe, N.M.: School of Advanced Research. Rose, Nikolas. 2000. “Community, Citizenship and the Third Way.” American Behavioral Scientist 43 (9): 1395–411. Sassen, Saskia. 2006. Territory, Authority, Rights: From Medieval to Global Assemblages. Princeton, N.J.: Princeton University Press. Simpson, Kate. 2004. “‘Doing Development’: The Gap Year, Volunteer-Tourists and a Popular Practice of Development.” Journal of International Development 16 (5): 681–81. Simpson, Kate. 2005. “Dropping Out or Signing Up? The Professionalisation of Youth Travel.” Antipode 37 (3): 447–69. Smith, Matt Baillie, and Laurie, Nina. 2011. “International Volunteering and Development: Global Citizenship and Neoliberal Professionalisation Today.” Transactions of the Institute of British Geographers 36: 545–59. Swidler, Ann, and Watkins, Susan Cotts. 2009. “Teach a Man to Fish: The Sustainability Doctrine and Its Social Consequences.” World Development 37 (7): 1182–96. Thomas, Barbara P. 1987. “Development through Harambee: Who Wins and Who Loses? Rural Self-Help Projects in Kenya.” World Development 15 (4): 463–81. Thomas, Lynn M. 2003. Politics of the Womb: Women, Reproduction and the State in Kenya. Berkeley: University of California Press. Titmus, Richard. 1997. The Gift Relationship. From Human Blood to Social Policy. New York: New Books. Widner, Jennifer. 1992. The Rise of a Party-State in Kenya: From Harambee! to Nyayo!. Berkeley: University of California Press. Wipper, Audrey. 1975. “The Maendeleo ya Wanawake Movement in the Colonial Period: The Canadian Connection, Mau Mau, Embroidery and Agriculture.” Rural Africana 29: 197–201. Wipper, Audrey. 1978. “The Maendeleo ya Wanawake Organization: The Co-optation of Leadership.” African Studies Review 18 (3): 99–120.